As well as importing dives, you can share other data with buddies. MacDive provides two options for sharing sites. You can choose Export > Sites As KML to export all of your sites as a KML file that can be opened with Google Earth. MacDive can also export sites in its own format which it can read back in. This data can be used to send sites to your buddies, or even help them update missing GPS coordinates. To export sites, go to the Sites screen, select one or more sites and then choose Export > Selected As XML from the menu. You can save this file and share it with a buddy. MacDive can import its own Site files that were described in the previous section. You can drag and drop a site XML file that a buddy has shared with you on to the main window. MacDive will either tell you there were no new sites found or it will provide you with a preview of what it will do. MacDive will either add sites that weren't found, or it may find a matching site and offer to update the GPS (if the site does not already have coordinates attached). This is useful in case you have logged the same sites as a buddy, but don't have the GPS coordinates loaded. It will also try and match sites that have slightly different locations or spellings. The left hand column shows sites found in the file. The middle column shows the action to take. This will be either Add Site (to create a new site that you haven't found), Update GPS (if you already have the site in your log, and it does not have GPS), or Ignore to simply do nothing. 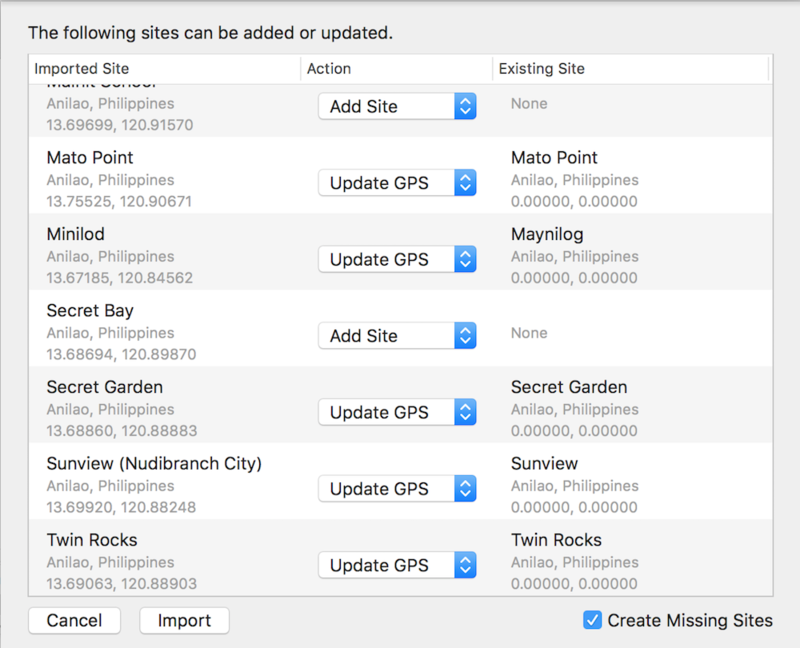 You can uncheck Create Missing Sites to skip creating any new sites that were found in the file, if you're only trying to update existing ones with GPS coordinates. In a similar fashion to Sites, you can choose Export > Selected As XML from the Critters screen to export any selected critters to a file. This file can be shared with buddies, and they can import it by simply dragging dnd dropping it on to the main window. The Critter import is, currently, straightforward. Any Critters in the file are added unless an exact match is found in your existing log.